Me (thinking): This is why I love my city! It is the best! The kind of tree I'd want to date and bring home to my family -- if their homes had higher ceilings. Then, I just happened to turn away from this gorgeous blast of nature in the heart of Gotham when I got smacked upside the head by a tree behind me that was blooming in its own Big Apple snarky-style way. 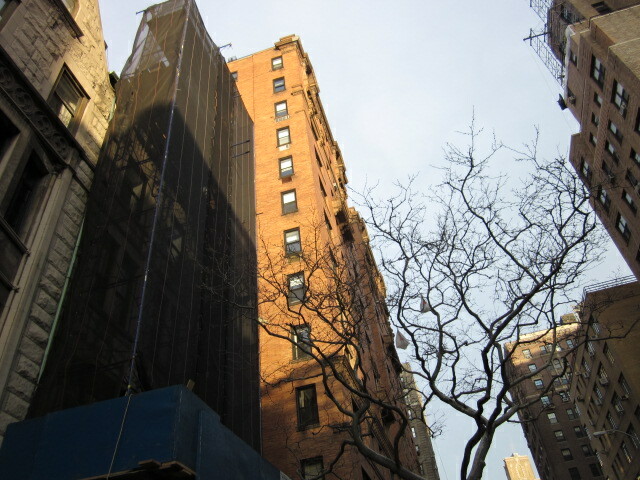 A way that played into the typically negative New York City stereotype. Casual Observer (thinking): Are you smoking crack? There’s nothing blooming on that tree! Me: Take a closer look. Are those barren branches decorated with trash? Do you see? Here, take an even closer look. 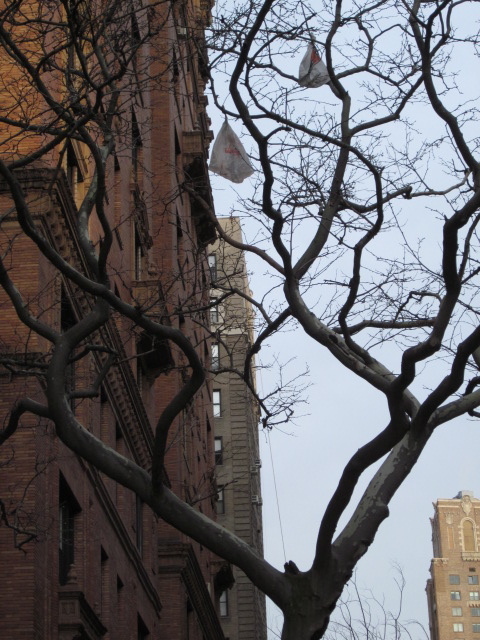 An original way to pursue ad space: hang your ad off these branches? 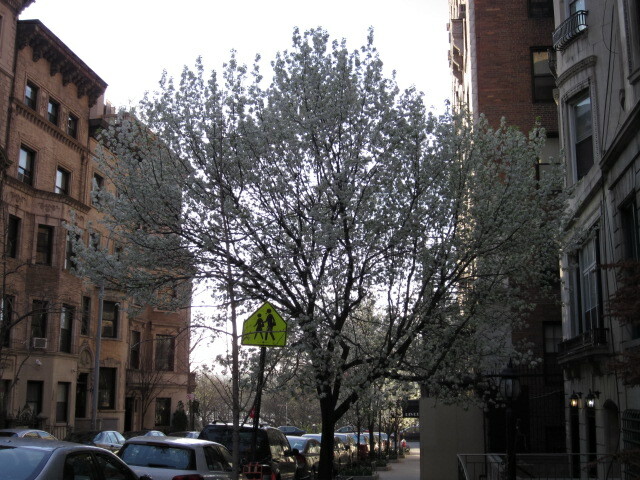 Yes, this tree’s branches are blooming with trash bags. One with the message, “Thank you,” and the other is from my go-to grocery store, Fairway. Why these bags are hanging from these branches is a mystery to me. Considering that the population of Manhattan Island is 1,585,873 (2011 data) and there are 69,467.5 persons per square mile, odds are good that on a land mass so dense with humanity, undoubtedly including many slobs, the naked eye is going to see a lot of crazy stuff – including shopping bags that somehow end up tangled in tree branches. 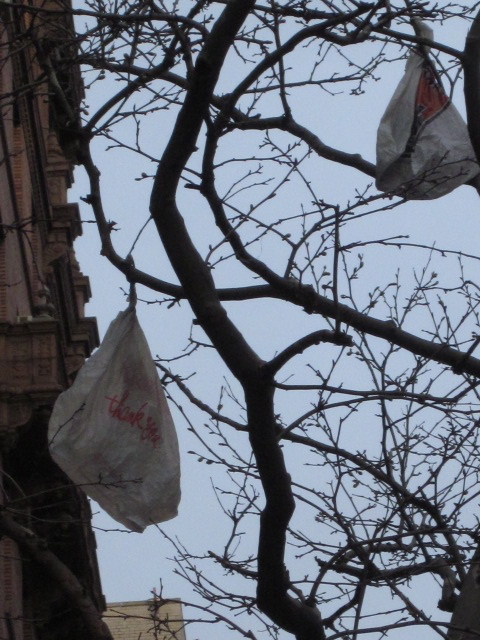 Possibly an exuberant sanitation worker overshot his garbage truck twice and these bags got caught in the branches or maybe a pigeon ate a steroid and dropped these bags to show off? Does anyone else have an opinion about how they got there? I suspect these shopping bags are going to be hanging around throughout spring and well into summer. That’s okay with me. When I need to avoid ogling suspended litter, I’ll just focus west on that Dogwood Tree — until it sets off my allergies, makes me sneeze my head off and I revise my thinking about how wonderful it is. This entry was posted in Humor, new york city and tagged big city, blooming, dogwood, junk, litter, nature, stupidity, trash, tree. Bookmark the permalink. In Fairway’s case, it’s unintended advertising! I’m guessing that kids, or drunk adults, threw those bags up into the trees, or down from an apartment window. Or else it’s a strange genetic experiment involving grafting. I don’t think the bags landed in the branches because they were tossed from the building across from it for it’s blanketed in a covering as its facade undergoes work or repair — possibly from getting hit with too many airborne trash bags. I like the squirrel storage container suggestion. Seeing that I seriously doubt any human is going to climb a tree to affix these ornaments (advertising notwithstanding), I agree with Jeremy that they are some random squirrel’s storage container. I see a TLC or NatGEO series called Squirrel Storage Wars in the offing. After I sober up, I will be leaning toward the opinion that the perpetrator of this nefarious act of arboreal vandalism is none other than the wind. This is quite ironic in the sense that when we are office-bound, the trees are nearly only indication that it is windy outside. Squirrel Storage Wars sounds like a reality TV winner to me. Watch out Jersey Shore! Hm, you think it might be the wind? Possibly they’ve been hanging there since Hurricane Irene blew around these parts and my great powers of observation to take notice only kicked in recently. Don’t get down on your powers of observation. Quite honestly there’s been nothing to see among those barren branches since mid-November. Once they were abloom you took notice. Once they were abloom with trash! What a total hoot! Who’d have thought tree trash would be blooming in the Big Apple! Now you know! Good thing you read LA for its vast educational component Kathy. I ate dumplings on the upper west side at magic hour the other night…right by the river. it was beautiful. especially after sitting in the office the whole day. I laughed when I saw garbage bags on the trees in your picture! Glad you were amused! Yes, magic hour in the evening is wonderful, especially when compared to magic hour around 6 or 7 in the morning. Not only would I be blind to the trash in the trees at that ungodly hour, odds are good I’d walk right smack into a tree. Probably sleep-walk. I thought I just saw some sort of white bird fly by my window right now. It was actually a plastic trash bag. It probably wafted down off a tree. I hope it didn’t have a picture of a bird on it. That would have been cruel to you buddy! I love the trees that bloom shoes – all kinds of shoes. That always makes me laugh. And then I want to climb up there and try them all on. Shirley, you jest, but sometimes I have actually seen sneakers in trees and somehow hanging atop traffic light arms. I find it hard to believe that the wind blew those there figuring this is man(or woman)-made. I’ll keep an eye out for this Gotham City non-phenomenon. Interesting theory. Possibly they’ve acquired the sneakers from their captives?